Anthony Rizzo's enjoyed his debut at Wrigley Field. 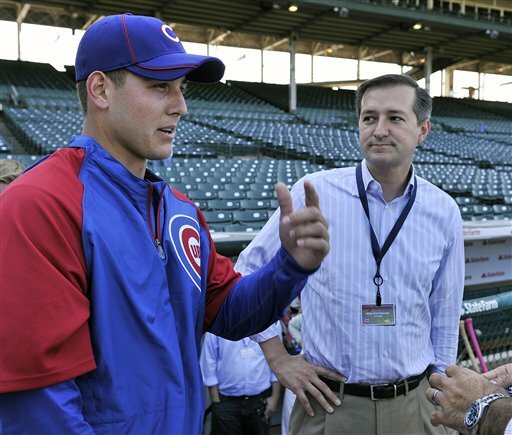 Rizzo meets with Cub owner Tom Ricketts at Wrigley beofre first game as a Cub. As this baseball season winds down for the Cubs in a transition year, the record is not the focus of President Theo Epstein and General Manger Jed Hoyer. Their eyes are on the changes and the mixture of personnel that will constitute the future of this ball club. 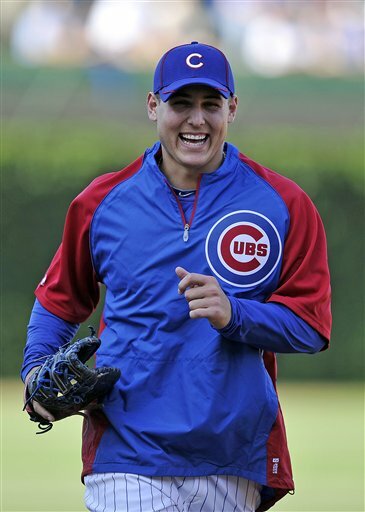 One integral player that fully reflects this new Cubs team is Anthony Rizzo. Most people know the story of how he became a Cub, but it bears repeating. He was a 6th round draft pick of Epstein and Hoyer when they both were in Boston. Hoyer became GM of the San Diego Padres and acquired Rizzo in a deal from the Red Sox. In one of their first moves, when they became the management team in Chicago, they dealt former Cubs first draft pick, pitcher Andrew Cashner and minor leaguer Kyung Mia Na for Anthony Rizzo and minor leaguer Zach Cates. There was no doubt that Rizzo was a player they wanted to be part of the re-building of the club. This is not the first time that a General Manager made a deal for a player more than once and ended up at Wrigley Field. Larry Himes was General Manager for the White Sox and fell in love with a Texas outfielder, Sammy Sosa. He acquired Sosa from the Rangers in 1989. After Himes left the South Side and moved to the Cubs as GM, one of his first trades was for, wait for it, Sammy Sosa (in exchange for George Bell in 1992). Like or hate Sosa, you cannot deny he became an icon for the Cubs — all because a GM wanted him so badly for his team. This is not at all a comparison of Sosa and Rizzo as players; I just wanted to point out how sometimes management believes in a player so much and desires them to be in their system. That is definitely the case with Rizzo. Hoyer called up the young player to the major leagues last year in San Diego and he failed to make an impact. What is particularly refreshing is the Cubs GM admitted his mistake and did not want that to happen again to the Cubs first baseman this year. After playing for the Triple A Iowa team and ripping the cover off the ball, Rizzo was brought up on June 28th at Wrigley Field. “It’s easier the second time around,” says Rizzo, “I learned from the last year the hype and expectations that came with it.” There was plenty of hype when he stepped on the field at Wrigley, not only was every media outlet present, but owner Tom Ricketts, and all the Cubs management team were there for batting practice. Hoyer told me it was even larger last year in San Diego. Rizzo has “answered the bell”; in his first five games he had three game winning RBIs and was “Rookie of the Month” in July. He just turned 23 and has the shown great poise at the plate and excellent defense at first base. What is unusual is this rookie is batting third, one of the most important spots in a lineup. “When I came here, Dale (Sveum) told me I was batting third — I was ecstatic,” said Rizzo. He thinks it’s “pretty cool” that the superstars in the league bat either 3rd or 4th and now he is doing it too. While he is now enjoying his time in the big leagues, life gave him a tough turn in his first minor league season with the Red Sox. Just like the Cubs&apos; Tony Campana, Rizzo survived a bout with Hodgkin’s lymphoma. His legs were swollen, along with other symptoms and a quick diagnosis helped him recover in six months. “It was crazy, I was 18 playing professional baseball and I got sick,” said Rizzo. “I give all the credit to the doctors in Boston and the Red Sox organization for making me and my family feel comfortable.” He now looks back at that time as a “hiccup” in his young life. His illness made him grateful when he returned to the playing field. Anthony Rizzo is also grateful to the Cubs management team for bringing him to Chicago. Especially since he had a poor experience in the majors last year. “They have a lot of faith in me and I appreciate that, they could have written me off,” said Rizzo. Now he is with the Cubs and is part of a team in transition. He loves day baseball, enjoys his young teammates — and there are lots of young players as a result of all the trades. Rizzo knows there will be ups and downs but thinks they will “stay on top of each other.” He has a very warm and easy-going demeanor, which he says come from his dad. Yet, like his mother, he won&apos;t allow anyone to push him around. He is 6&apos;3" and 220 lbs., a big young man that can be the next Cubs icon — at least that is what Cubs management is banking on.